Background: As wearable sensors/devices become increasingly popular to promote physical activity (PA), research is needed to examine how and which components of these devices people use to increase their PA levels. Aims: (1) To assess usability and level of engagement with the Fitbit One and daily SMS-based prompts in a 6-week PA intervention, and (2) to examine whether use/ level of engagement with specific intervention components were associated with PA change. Methods: Data were analyzed from a randomized controlled trial that compared (1) a wearable sensor/ device (Fitbit One) plus SMS-based PA prompts, and (2) Fitbit One only, among overweight/obese adults (N=67). We calculated average scores from Likert-type response items that assessed usability and level of engagement with device features (e.g., tracker, website, mobile app, and SMS-based prompts), and assessed whether such factors were associated with change in steps/day (using Actigraph GT3X+). Results: Participants reported the Fitbit One was easy to use and the tracker helped to be more active. Those who used the Fitbit mobile app (36%) vs. those who did not (64%) had an increase in steps at 6-week follow-up, even after adjusting for previous web/app use: +545 steps/ day (SE=265) vs. −28 steps/ day (SE=242) (p=.04). Conclusions: Level of engagement with the Fitbit One, particularly the mobile app, was associated with increased steps. Mobile apps can instantly display summaries of PA performance and could optimize self-regulation to activate change. More research is needed to determine whether such modalities might be cost-effective in future intervention research and practice. In the U.S, the growing and linked epidemics of obesity and physical inactivity have severe health consequences,1–4 and there is a need to develop cost-effective health behavior interventions to increase physical activity (PA) at the population level. Past PA interventions that have been successful have focused on self-regulatory skills whereby people were encouraged to manage their own behavior change by setting goals and self-monitoring.5,6 For example, pedometer-7–10 and/or web-based11–13 interventions have shown that providing participants with feedback on PA performance and asking them to record their steps can increase motivation and PA levels. Advancements in technology provide increasingly more opportunities to facilitate users to build self-regulatory skills including self-monitoring of PA. The Fitbit One is a commercially available device that measures PA with a small wearable tracker (accelerometer) and displays instant PA readings. These data such as total number of steps per day can be uploaded to a personal website (Fitbit.com) or mobile application software (app) on a smartphone or tablet for comprehensive summaries of PA data across time – through which individuals can assess their self-regulatory change processes. Process evaluations of health behavior interventions often make the distinction between the amount of program components delivered or provided to participants (“dose delivered”) vs. the extent to which participants actively engage in those prescribed activities (“dose received”).14 Although devices like the Fitbit One possess the technology to help build self-regulatory skills for PA, the level of engagement with the device is ultimately up to the individual. In other words, the simple act of making the device accessible does not necessarily guarantee that people will actively engage with the technology and benefit from the technology. There is a dearth of information about the level of engagement with a PA monitoring device (e.g., Fitbit One) and the impact of engagement level on self-regulatory skills and behavior change. The purpose of this study was to evaluate users’ actual level of engagement with the Fitbit One (particularly its various components) to determine the potential effects of this technology for increasing PA. In our previous work, we tested the effects of the Fitbit One with and without SMS-based prompts to promote physical activity in a 6-week randomized controlled trial (N=67). All participants were provided a Fitbit One to monitor their activity levels. Overall, the combined intervention (Fitbit One with SMS-based PA prompts) was not successful in increasing PA levels for more than one week.15 A possible explanation for the loss of these study effects in PA change could be in part due to a lack of engagement with the intervention components. In this current study, we hypothesized participants’ level of engagement with the intervention components, specifically the (1) Fitbit tracker, (2) Fitbit website, (3) Fitbit mobile app, (4) and/or text messages, would be positively associated with objectively measured change in number of steps at 6-weeks follow-up (as measured by the Actigraph GT3X+). The study consisted of a two-arm design where half the participants were randomized to receive daily SMS-based PA prompts and all participants received the Fitbit One. The study employed convenience sampling for recruitment in San Diego from January 2013 – January 2014, mostly among a pool of women from a mammography registry at the University of California, San Diego (UCSD), Moores Cancer Center, who had consented to being contacted for research opportunities. Additionally, participants were recruited via word-of-mouth and flyers that were posted throughout the community including the UCSD and San Diego State University campuses. Initial study eligibility was assessed over the telephone and the criteria included being a non-smoker, 19–69 years of age, overweight or obese (calculated BMI of >25 kg/m2 using height and weight), and not meeting recommended PA guidelines for adults (<150 min/wk moderate-to-vigorous intensity physical activity, or MVPA). Additionally, the eligibility criteria included self-reported motivation to increase PA levels within a month from screening assessed using a 1-item question, physical fitness to increase PA levels assessed by self-reported responses from the “Physical Activity Readiness Questionnaire” (PAR-Q), ability to use SMS text messaging on a personal mobile phone, and access to a personal computer that was capable of running the Fitbit One software. The UCSD institutional review board approved the study protocol and all participants provided written informed consent. All participants in both intervention and control groups were asked to wear a Fitbit One tracker every day and to upload PA data from their tracker to the website (Fitbit.com) and/or mobile app. The tracker allowed participants to receive instant feedback on their PA performance and the uploaded data from the tracker to the website or mobile app provided more detailed summaries of their daily PA data in their personal Fitbit accounts. Study personnel emphasized the importance of uploading and charging the Fitbit One daily in an effort to minimize missing data. Participants randomly assigned to the intervention group were contacted by either telephone and/or email to indicate three preferred times of the day (for each day of the week) to receive text message reminders to engage in PA. They were informed that they could contact the study at any time if they wanted to change their pre-set schedules. Study personnel constructed 42 text message reminders (<150 characters) and used a commercially available website (Eztexting.com) to program and schedule automatic delivery of all text messages. The full set of text messages was delivered over a 2-week period and repeated throughout the 6-week study period. The content of the messages were basic reminders to engage in PA (e.g., “Good morning [name]! This is your 9AM reminder to do at least a 10-minute bout of moderate-to-vigorous intensity physical activity.”). A brief follow-up questionnaire was conducted over the telephone at the end of the 6-week study period. 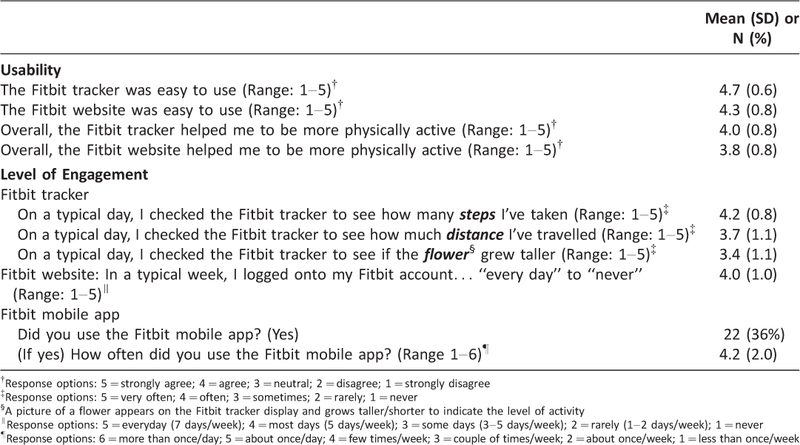 Items asked participants about their experience with the Fitbit One (i.e., tracker, website, and mobile app), and in the intervention group only, the SMS-based PA prompts. Specifically, these items assessed participants’ attitudes on the usability of the Fitbit One and SMS text messages in addition to whether they thought these intervention components were useful in helping them to increase their activity levels. Questionnaire items on the Fitbit One were: “The Fitbit tracker was easy to use,” “Overall, the Fitbit tracker helped me to be more physically active,” “The Fitbit website was easy to use,” and “Overall, the Fitbit website helped me to be more physically active” [Ratings: 5=strongly agree, 4=agree, 3=neutral, 2=disagree, or 1=strongly disagree]. Items on the SMS-based PA prompts were: “Daily text messages that prompted me to be physically active helped me to be more physically active” [Ratings: 5=strongly agree, 4=agree, 3=neutral, 2=disagree, or 1=strongly disagree] and “The 3 daily text messages that prompted me to be physically active were…” [Response options: 3=too many, 2=just right, or 1=too few]. Participants were asked to assess their actual use and responses, or their level of engagement, with each intervention component. Items on using the Fitbit tracker were: “On a typical day, I checked the Fitbit tracker to see… (1) how many steps I’ve taken, (2) how much distance I’ve travelled, and (3) if the flower grew taller (for PA intensity) [Ratings: 5=very often, 4=often, 3=sometimes, 2=rarely, or 1=never]. Item on the Fitbit website (fitbit.com) was: “In a typical week, I logged onto my Fitbit.com account…” [Ratings: 5=every day (7 days/week), 4=most days (5 days/week), 3=some days (3–5 days/week), 2=rarely (1–2 days/week), and 1=never (0 days/week)]. Items on the Fitbit mobile app were: “Did you use the Fitbit mobile app?” [Ratings: 1=yes or 0=no]. If yes, “How often did you use the Fitbit mobile app?” [Ratings: 6=more than once a day, 5=about once a day, 4=few times per week, 3=couple times per week, 2=about once per week, or 1=less than once per week]. Items on SMS-based PA prompts were: “Overall, did you engage in at least a 10-minute bout of physical activity after receiving a text message from the study? Would you say…” [Ratings: 5=always, 4=usually, 3=about half the time, 2=rarely=2, or 1=never] and “How soon after receiving a text message did you engage in at least a 10-minute bout of physical activity? On average, would you say…” [Ratings: 7=1–30 minutes, 6=31–59 minutes, 5=1–2 hours, 4=3–6 hours, 3=7–9 hours, 2=10–12 hours, or 1=more than 12 hours]. Higher response scores indicated a higher level of engagement. Descriptive statistics were conducted for all variables. Mean (SD) or frequencies (N, %) were calculated for demographic variables including age, gender, education level, and ethnicity in addition to baseline BMI, physical activity (from Actigraph GT3X+), technology use, and confidence to change PA. Mean (SD) Likert-type response scores and frequencies (N, %) of yes/no responses were also calculated to assess self-reported usability and level of engagement for each Fitbit One and SMS-based intervention component. A mixed-model repeated measures analysis20 was conducted to test and compare weekly changes in steps between those who responded higher vs. lower level of engagement for each assessment item using 5–7 aggregated steps/day at follow-up with the Actigraph GT3X+. For example, Likert-type responses that described a participant’s level of engagement as “very often” and “often” were collapsed into one category (higher level of engagement) and “sometimes,” “rarely,” and “never” to another category (lower level of engagement). A random subject-specific intercept was included to model between subject variability. Fixed effects included in the models were time (i.e., pre-, and post-intervention), group (i.e., high vs. low engagement), and the group-by-time interactions. All models were adjusted for daily wear-time minutes of the Actigraph GT3X+ accelerometer. Adherence to modeling assumptions was tested using residual plots (e.g., qqplots to examine if residuals followed a Gaussian distribution). All analyses were conducted using SAS software, version 9.3 (SAS Institute Inc., Cary, North Carolina). A total of 61 participants completed the follow-up questionnaire. Mean (SD) response scores indicated that overall participants “strongly agreed” that the Fitbit tracker (4.7; SD=0.6) and “agreed” the Fitbit website (4.3; SD=0.8) were easy to use (Table 2). Participants also “agreed” that the Fitbit tracker (4.0; SD=0.8) was helpful for being more physically active, and somewhat “neutral” that the Fitbit website (3.8; SD=0.8) was helpful for increasing activity levels. Participants reported checking their Fitbit trackers “often” to view their steps (4.2; SD=0.8), and “sometimes” to view their distance (3.7; SD=1.1) and the intensity of their activity (3.4; SD=1.1). Overall, participants logged onto their personal Fitbit.com web accounts “at least 5 days/week” (4.0; SD=1.0). A total of 22 participants (36%) reported that they used the Fitbit mobile app, of which they also indicated that they used the app a “few times per week” (4.2; SD=2.0). Only intervention group participants were asked items about the text messaging intervention. A total of 31 participants completed these items (Table 3). Mean (SD) response scores indicated that overall participants were “neutral” about whether the text messages were helpful in being more physically active (3.0; SD=1.0). Participants’ reported that the frequency of three PA prompts per day were “just right” (2.5; SD=0.6). Overall, participants “rarely” engaged in a 10-minute bout of PA after receiving a text message (2.5; SD=1.0). If they did engage in a 10-minute bout of PA, the activity was performed approximately “3–6 hours” after receiving the text message (4.7; SD=1.2). 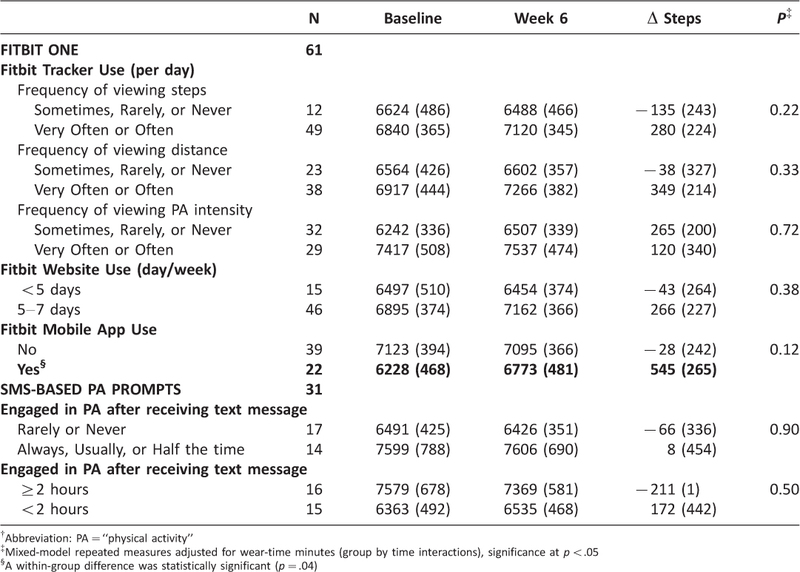 Generally, participants who were more engaged with the Fitbit One and/or SMS-based PA prompts were associated with greater mean (SE) change in steps per day at 6-week follow-up (Table 4). However, between-group differences were not statistically significant; specifically, participants who responded to frequently using the Fitbit One’s tracker to check their (1) steps count were associated with greater increases in steps (SE): +280 (224) steps/week in those who responded “very often” or “often” vs. −135 (243) steps/week for “sometimes,” “rarely,” or “never”; and (2) distance travelled: 349 (214) steps/week in those who responded “very often” or “often” vs. −38 (327) steps/week for “sometimes,” “rarely,” or “never.” Similarly, more frequent use of the Fitbit website (5–7 days vs. <5 days per week) was also associated with increases in steps (SE): +266 (227) steps/week vs. −43 (264) steps/week. As mentioned, in this study, we did not find group differences in changes in steps. However, there was a statistically significant within-group difference among those who responded “yes” vs. “no” to using the Fitbit mobile app: +545 (265) steps/week vs. −28 (264) steps/week, respectively, even after adjusting for previous web and/or app use for PA (p=.04). This finding warrants further investigation on the utility of mobile apps to keep participants engaged with a given device for self-regulation of their physical activity levels. 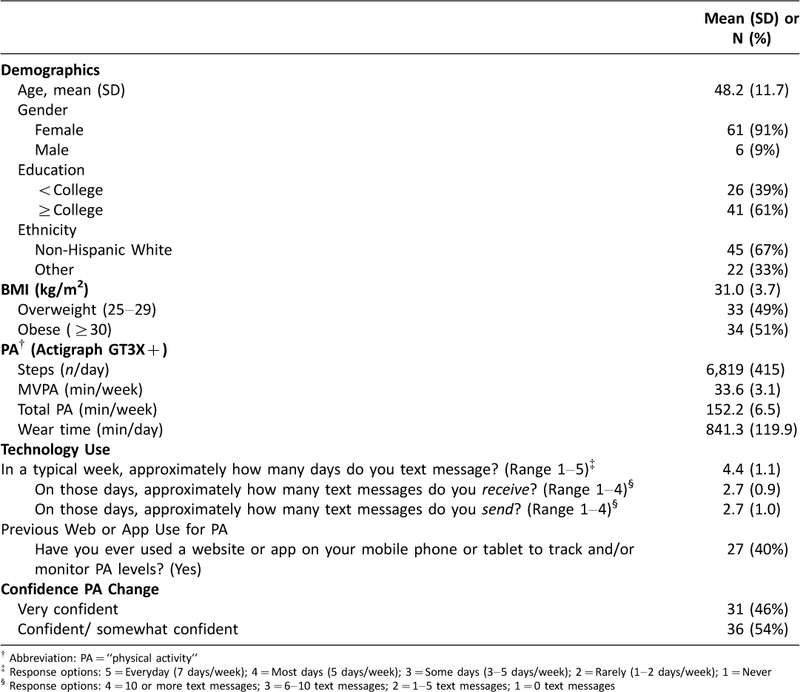 Only about half the participants who received SMS-based PA prompts responded that they engaged in PA “always,” “usually,” or “half the time” (vs. “rarely” or “never”) after receiving a text message, and this was associated with only a small increase of +8 (454) steps/day (vs. −66, SE=336). Among those who engaged in a 10-minute bout of PA <2 hours (vs. ≥2 hours), there was also an increase of +172 (442) steps/day (vs. −211, SE=1). Again, group differences were not statistically significant. In a sample of mostly overweight and obese middle-aged women, these data indicate that the Fitbit tracker was easy to use. Most participants reported that the Fitbit tracker was helpful in increasing their PA levels, more so compared to the Fitbit website. A comparison among the Fitbit tracker, website, and mobile app indicated that the mobile app was objectively useful in increasing PA levels from baseline to 6-week follow-up as measured by change in steps using an Actigraph GT3X+. Overall, participants who received the SMS-based PA prompts showed minimal engagement and change in physical activity levels. Overall, results from this study suggest that use and/or how much an individual engages with various intervention components could have an impact on PA change. Studies with larger samples are needed to reexamine and further elucidate the impact of participants’ level of engagement with specific mobile health intervention components. In this study, about a third of participants used the Fitbit mobile app and they had a significant increase in number of steps at follow-up. The Fitbit mobile app is a fusion of the tracker and website in that it is easily accessible, provides instant feedback on performance, and is capable of providing more in-depth PA data such as minutes of activity by intensity level (i.e., light, fairly, and very active minutes). Previous pedometer- and/or web-based interventions that have featured self-monitoring components involving PA records and logs on calendar or web pages have been shown to be efficacious in increasing PA levels.7–12,21–25 In this study, participants who used the tracker and website also increased their steps at follow-up and these data support a non-significant trend to suggest self-monitoring activities can be useful to promote changes in PA. Studies are needed to investigate whether these devices enhance the user’s ability to monitor their PA levels compared to traditional methods and also identify factors associated with what motivates individuals to use and engage with these devices for behavior change. Research on mobile app interventions is scarce despite their increasing popularity as devices like the iPhone include built-in sensors including accelerometers that allow even more opportunities for users to self-monitor their own health behavior. Results from this study provide data to indicate a significant positive association between using a PA mobile app and an increase in steps at follow-up. In this sample of overweight/obese adults, these results were stable even after adjusting for factors such as baseline motivation. Still, there are probably segments of the general population that might be more receptive to such technologies in monitoring their own PA levels–an area of research that remains to be examined and that could aid in more effective targeting of mHealth interventions. Overall, participants self-reported that the Fitbit One helped them to be more physically active but this was not supported by the objective measures of steps at follow-up that was recorded by the Actigraph GT3X+ accelerometer. This observation highlights a (1) strength of this study, namely, the use of a validated objective measure of PA and (2) discrepancy in participants’ perceptions about the utility of the Fitbit One to promote PA and actual outcomes. Therefore, studies that examine user experience of direct-to-consumer wearable devices like the Fitbit require rigorous trials in real-world settings over an adequate amount of time for measure of sustained long-term change. Overall, SMS-based PA prompts were not successful in promoting PA. More than half of the participants who received text messages indicated that they “rarely” or “never” did a bout of PA after receiving a text message. In the primary outcome study,15 we reported that these text messages as simple reminders to prompt PA were only able to achieve short-term effects that did not last more than one week. However, other text messaging PA interventions, with comparatively more content and intensity, have also reported short-term effects.26,27 In consideration of these findings, we recommend that future studies examine the utility of text messages to prompt self-monitoring rather than prompt the specific outcome behavior (e.g., physical activity). Studies have shown that it is possible to effectively train or coach participants, including those who were overweight, to self-monitor their PA by keeping records/logs in a diary, webpage, or PDA.12,19,28,29 Future studies could examine how SMS-based prompts can be used to prompt self-monitoring, and thus increase their level of engagement with the device, to promote PA. This study consisted of a convenience sample of overweight and obese adults who were inactive prior to the start of the 6-week trial. Results are therefore not representative of other populations who may require less help to increase their PA. A large proportion of the sample were middle-aged women from the UCSD mammography registry, who had consented to be contacted for research opportunities and therefore could have been more compliant and/or motivated to improve their health behavior compared to the general population. Also, it might be possible that a small sample size resulted in some of the large standard errors and did not provide adequate power to detect statistically significant group differences. The study relied on self-reported measures of participants’ level of engagement with the Fitbit One and text messages, which is prone to measurement biases including social desirability that can result in errors.30 However, the nature of the problem created challenges in obtaining objective measures of participants’ level of engagement primarily because the researchers did not have access to these data such as number of times participants logged onto the Fitbit website and duration of time actively spent on the website. It is recommended that researchers collaborate with companies like Fitbit Inc. to develop ways to obtain objective measures of these activities for future research purposes (with permission from study participants) to enhance the effectiveness of these devices in changing PA.
As wearable sensors/devices and other technologies including mobile apps become increasingly popular, there is a need to examine how and how much people use these devices for self-monitoring and changing PA behavior. In this study, greater use of self-monitoring components, particularly the use of the Fitbit mobile app, was associated with more PA. Mobile apps are accessible, instantaneous, and comprehensive having the potential to optimize people’s self-regulatory skills in setting and reaching their PA goals. More research is needed to examine people’s level of engagement with new technologies including mobile apps to determine whether these modalities might be cost-effective strategies in future intervention research and practice. This research was supported by a gift from the Carol Vassiliadis family; and manuscript preparation in part by the National Cancer Institute Grant CA-113710. The study would like to acknowledge UCSD undergraduate interns Quynh Nguyen and Amy Nham for their assistance in study implementation. 1. Bassuk SS, Manson JE. Epidemiological evidence for the role of physical activity in reducing risk of type 2 diabetes and cardiovascular disease. J Appl Physiol 2005;99(3):1193–204. 2. Eheman C, Henley SJ, Ballard-Barbash R, et al. Annual report to the nation on the status of cancer, 1975–2008, featuring cancers associated with excess weight and lack of sufficient physical activity. Cancer 2012;118(9):2338–66. 3. Malnick SDH, Knobler H. The medical complications of obesity. QJM 2006;99(9):565–79. 4. Beasley JM, Kwan ML, Chen WY, et al. Meeting the physical activity guidelines and survival after breast cancer: findings from the after breast cancer pooling project. Breast Cancer Res Treat 2012;131(2):637–43. 5. Bandura A. Social cognitive theory of self-regulation. Organ Behav Hum Decis Process 1991;50(2):248–87. 6. Michie S, Abraham C, Whittington C, et al. Effective techniques in healthy eating and physical activity interventions: a meta-regression. Health Psychol 2009;690–701. 7. DuVall C, Dinger MK, Taylor EL, et al. Minimal-contact physical activity interventions in women: a pilot study. Am J Health Behav 2004;28(3):280–6. 8. Tudor-Locke C. A preliminary study to determine instrument responsiveness to change with a walking program: physical activity logs versus pedometers. Res Q Exerc Sport 2001;72(3):288–92. 9. Chan CB, Ryan DAJ, Tudor-Locke C. Health benefits of a pedometer-based physical activity intervention in sedentary workers. Prev Med 2004;39(6):1215–22. 10. Kang M, Marshall SJ, Barreira TV, et al. Effect of pedometer-based physical activity interventions: a meta-analysis. Res Q Exerc Sport 2009;80(3):648–55. 11. Faghri PD, Omokaro C, Parker C, et al. E-technology and pedometer walking program to increase physical activity at work. J Prim Prev 2008;29(1):73–91. 12. Cadmus-Bertram L, Wang JB, Patterson RE, et al. Web-based self-monitoring for weight loss among overweight/obese women at increased risk for breast cancer: the HELP pilot study. Psychooncology 2013;22(8):1821–8. 13. Vandelanotte C, Spathonis KM, Eakin EG, et al. Website-delivered physical activity interventions. Am J Prev Med 2007;33(1):54–64. 14. Linnan L, Steckler A. Process Evaluation for Public Health Interventions and Research. San Francisco: Jossey-Bass 2002. 15. Wang JB, Cadmus-Bertram LA, Natarajan L, et al. Wearable sensor/device (Fitbit One) and SMS text-messaging prompts to increase physical activity in overweight and obese adults: a randomized controlled trial. Telemed e-Health 2015;150602112714008. 16. Le Masurier GC, Lee SM, Tudor-Locke C. Motion sensor accuracy under controlled and free-living conditions. Med Sci Sport Exerc 2004;36(5):905–10. 17. Bassett DR, John D. Use of pedometers and accelerometers in clinical populations: validity and reliability issues. Phys Ther Rev 2010;15(3):135–42. 18. ActiLife 6 Data Analysis Software User’s Manual. ActiGraph Web site. http://dl.theactigraph.com/SFT12DOC13%20-%20ActiLife%206%20Users%20Manual%20(Rev%20A).pdf. Published April 3, 2012. (accessed 16 Dec 2015). 19. Troiano RP, Berrigan D, Dodd KW, et al. Physical activity in the United States measured by accelerometer. Med Sci Sports Exerc 2008 Jan;40(1):181–8. 20. Cnaan A, Laird N, Slasor P. Tutorial in biostatistics: using the general linear mixed model to analyse unbalanced repeated measures and longitudinal data. Stat Med 1997;16:2349–80. 21. Watson A, Bickmore T, Cange A, et al. An internet-based virtual coach to promote physical activity adherence in overweight adults: randomized controlled trial. J Med Internet Res 2012;14(1):e1. 22. Harvey-Berino J, Pintauro SJ, Gold EC. The feasibility of using internet support for the maintenance of weight loss. Behav Modif 2002;26(1):103–16. 23. Harvey-Berino J, Pintauro S, Buzzell P, et al. Does using the internet facilitate the maintenance of weight loss? Int J Obes Relat Metab Disord 2002;26(9):1254–60. 24. Tate DF. Using internet technology to deliver a behavioral weight loss program. JAMA 2001 Mar 7;285(9):1172. 25. Tate DF, Jackvony EH, Wing RR. Effects of internet behavioral counseling on weight loss in adults at risk for type 2 diabetes: a randomized trial. JAMA 2003;289(14):1833–6. 26. Hurling R, Catt M, Boni M De, et al. Using internet and mobile phone technology to deliver an automated physical activity program: randomized controlled trial. J Med Internet Res 2007;9(2):e7. 27. Conroy MB, Yang K, Elci OU, et al. Physical activity self-monitoring and weight loss: 6-month results of the SMART trial. Med Sci Sports Exerc 2011;43(8):1568–74. 28. Burke LE, Wang J, Sevick MA. Self-monitoring in weight loss: a systematic review of the literature. J Am Diet Assoc 2011;111(1):92–102. 29. Gleeson-Kreig JM. Self-monitoring of physical activity: effects on self-efficacy and behavior in people with type 2 diabetes. Diabetes Educ 2006;32(1):69–77. 30. DiIorio CK. Measurement in Health Behavior: Methods for Research and Evaluation. San Francisco, CA: John Wiley & Sons 2006.